Throughout December and the new year, we’ve been helping some of our clients reach their target audience through a series of emails promoting their products. Lets take a look at one client in particular, Newcastle Drum. December is traditionally the Drum Centres busiest time of year, this December was even busier than usual after the launch of their brand new website. The drum centre wanted to help highlight some of the amazing deals they had on offer, both in the run up to Christmas and also for their January sales (which ends very soon. For a quick and cost effective way to speak to your existing user base, email marketing remains the best option for a lot of businesses. 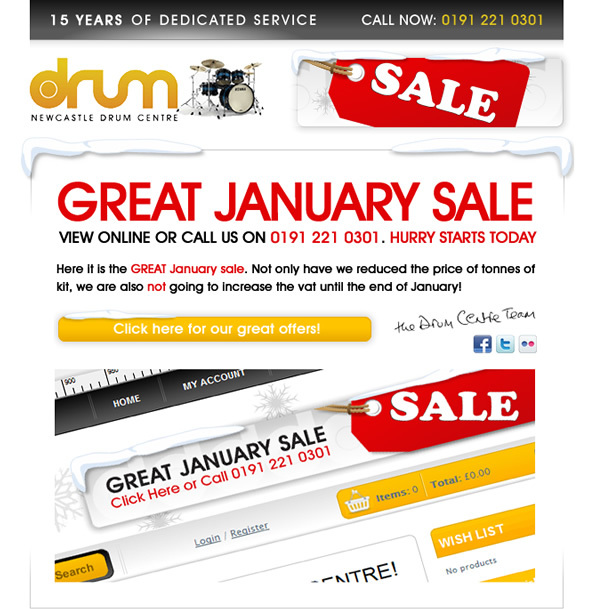 We helped the drum centre plan out a series of emails, highlighting specific deals at certain times. The email campaigns that have been sent out over the Christmas and new year periods have seen a massive rise in traffic on the website, and with this an upturn in order numbers. As well as using email marketing as a direct sales tool, the drum centre plan to use it as a method of keeping customers up to date with what’s going on both in the shop and in the industry. An ideal example of this is the upcoming NAMM show in California, which the drum centre team will be attending. They’ll be keeping customers updated of all of the latest products, news and gossip directly from the show. Although email is one of the oldest forms of communicating on the Internet, nothing is as cost effective or bespoke for small to medium size businesses. Read more about email marketing from Union Room and see how we can help you reach your audience.